What should or shouldn’t I be putting into the septic system? People need to remember that if it is going down a drain or toilet, it is all going to end up in one line out to the septic tank and leaching system which is most often a leachfield. Grease, cat litter, coffee grounds, baby or handiwipes … all these products, even though they claim they are septic safe, are detrimental to your system. We have even seen caustic chemicals (drain cleaners) that claim to be septic tank safe. Well, it probably won’t harm your septic tank itself, but may kill your leachfield. Human waste and toilet paper are the only things that should go through your system. We recommend 1-ply toilet paper. A good test is to take the toilet paper, put it in water, swirl it around and if it breaks up right away, it is a safe product for your bathrooms. Additionally, use of Bio-Clean can help keep your septic system working more efficiently, and perhaps even help extend its life. Why does a septic tank need to be pumped? Doesn’t the bacterial action take care of the waste? In Alaska, tanks need to be pumped more often than in warmer climates since they are generally buried deeper. Since bacterial action works best in above 60 degree temperatures, and the temperature here averages about 47 degrees, solids accumulate faster and decrease the ability of the system to move the water into the leachfield at an acceptable rate. Additionally, we are using chemicals and chlorine in greater amounts than even 20 years ago which destroys the natural bacterial action in the tank. Periodic and proper pumping will remove this accumulation allowing the septic to perform effectively. Septic systems typically have two major components: a septic tank and subsurface disposal field (also known as a leachfield or drainfield). The tank is a watertight receptacle designed to receive domestic wastes. The lighter solids called scum (mainly grease) floats to the top. The heavy solids settle to the bottom where bacterial action partially converts them to a digested sludge. The liquid portion in the middle called effluent or “gray water” flows out of the tank through solid and perforated pipes to the leachfield which is composed of sewer rock. Here, remaining solids further decompose and the liquid is absorbed into the soil, evaporates or is taken up by plants. Proper maintenance through regular pumping will remove excess solids and sludge, thereby extending the life of the average septic system by many years. 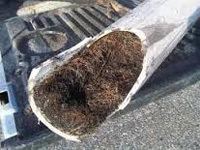 We often hear, “Well, if it isn’t broke, don’t fix it” in terms of septic maintenance. You wouldn’t drive your new car 10,000 miles without checking the oil. The same principle applies to the septic system. Unfortunately, the first septic “emergency” usually marks the beginning of the end. All too often we see non-believers become believers when their septic system backs up or they fail an adequacy test and have to replace the entire system. Once a system starts to back up, it is generally the result of an accumulation of solids in your tank. Grease and non-biodegradable such as tissue, cigarette butts, feminine products, baby wipes, etc. flow into the leachfield and slowly clog the sewer rock and the walls of the leach ditch. Eventually, the water has no place to go and backs up into your house or business. By using water sparingly, eliminating chlorine products, and pumping regularly, your septic system should give you years of trouble-free service. How often should we clean our septic tank? In Alaska, tanks need to be pumped more often than in warmer climates since they are generally buried deeper. Since bacterial action works best in above 60 degree temperatures, and the temperature here averages about 47 degrees, solids accumulate faster and decrease the ability of the system to move the water into the leachfield at an acceptable rate. Additionally, we are using chemicals and chlorine in greater amounts than even 20 years ago which destroys the natural bacterial action in the tank. 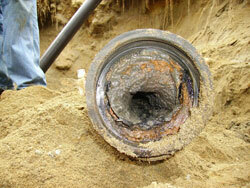 Periodic and proper pumping will remove this accumulation allowing the septic to perform effectively. How long should it take to pump the tank? On the average, it should take a septic pumper between 20 and 35 minutes to clean a 1000 or 1250 septic tank which may include 1 or 2 backwashes, if needed. It may take longer if a tank has not been pumped for a while and there is an accumulation of solids and grease in the tank. Oftentimes rocks, diapers, baby wipes (which do not belong in the tank) will plug the hoses which results in extra time spent to service the septic. Also known as a backflush, this is where the pumper literally goes back to his truck and reverses the pump to shoot liquid back down into the tank. This is done to break up the accumulation of solids at the bottom of a tank thereby allowing the pumper to clean the tank. However, when a tank has been neglected and there is a large build up of hard solids at the bottom of the tank, the pumper may have to do more backwashes. Sometimes even that is not enough to break up the solids and more comprehensive service is needed. Additional time spent cleaning the tank due to accumulation of solids and grease will generally result in increased costs to the home or business owner. Periodic pumping helps keep those costs down and extends the life of the septic system. How do I know I got a good septic pumping? We recommend that the homeowner be present when the pumper comes. You can see how long the job takes, whether backwashes are needed and ask questions regarding the condition of the septic. If you cannot be present, we suggest that you take a strong flashlight and look down into the incoming standpipes of your tank (the 1st pipe on the septic tank) See diagram. First you want to be sure that it was your septic that was pumped. (It has been known to happen that the wrong tank has been pumped out what with missing street signs, lack of house numbers and new drivers on a route). If pumped properly, you should not see any solids at all. “Mountains of solids” are an indication you did not get a clean tank. 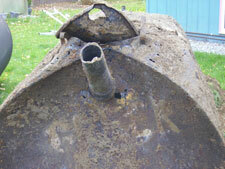 A properly cleaned tank will extend the life of your septic system for years. When is the best time of year to pump? We can pump a septic any time of year. Spring and summer are better as the ground is a bit warmer thereby allowing the bacterial action in a septic tank to start up faster. Many people like to wait until fall to schedule a service call as part of their pre-winter maintenance. However, if standpipes are cut low or flush with the ground, remember to mark them in case of a winter back up. I don’t know how big my tank is can you tell me? When garbage disposals are installed, an additional 250 gallons is recommended. Garbage disposals deposit raw sewage into the tank. Raw sewage takes longer to be broken down by bacteria. It can float over the baffles and into the leachfield, creating a potential blockage which may only be corrected by excavating. Do you pump the whole tank? A septic tank, depending on size and number of people, can fill to proper operating level in approximately 10 days after it has been pumped. The proper operating level can be determined by looking down one of the two standpipes/monitor tubes located above the septic tank. This can be done by using a flashlight that can narrow down to a beam. From where the pipe/tube end at the top of the tank and where the water level is, you should see approximately a foot of air space. Every septic tank has a reserve built into it. The “foot of air space” that you’ll see in a 1000 gal. tank is approximately 250 gallons. This indicates that your septic system is functioning at the proper operating level. Should I be putting enzymes in my septic? Yes. Septic tanks are designed to allow bacteria and enzymes to biodegrade organic waste. However, natural bacterium do not work well on protein, fiber or grease. Furthermore, modern chemistry has provided us with advanced cleaning products made of complex molecules which kill the bacteria normally found in a tank. And with colder ground temperatures found in Alaska, the natural bacteria need all the help they can get. ALPINE is the Valley distributor of Bio-Clean which is formulated to break down ALL types of biodegradable waste and is environmentally friendly. It contains a higher quality, unique combination of ingredients not found in other products. Monthly maintenance treatments cost significantly less than inconvenient back ups and replacing leachfields. TIP: Beware of telemarketers who claim their products will eliminate pumping. Why should I call ALPINE? Because we are a full service septic company, we can take care of almost all of your wastewater or excavation needs – commercial, industrial and residential. We give personalized service to our customers and focus on the education of the consumer in order to help keep your system operating as efficiently as possible. This saves time, money and the environment. Feel free to contact us with any questions you may have on septic maintenance, installation or repair.